matures into a meaty fowl in a reasonable amount of time. Crevecoeur chickens boast a short grained, extremely white meat on small boned skeleton. They have a high percentage of meat to total carcass weight. 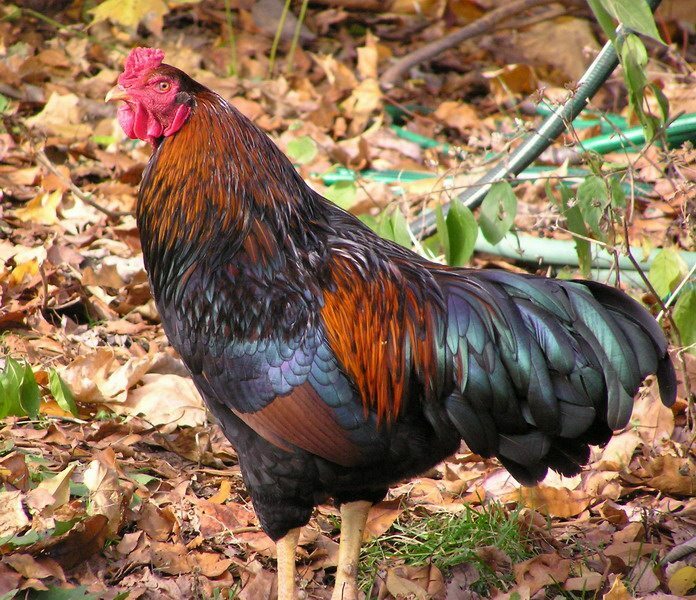 The Crevecouer standard sized rooster weighs eight pounds and the hen seven. The bantams run around two pounds. 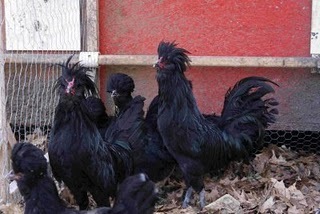 Crevecoeurs have a lordly appearance in their full black crest with matching beard and muffs. Their plumage, jet black with a greenish tint, distinguishes them on the exhibition floor. 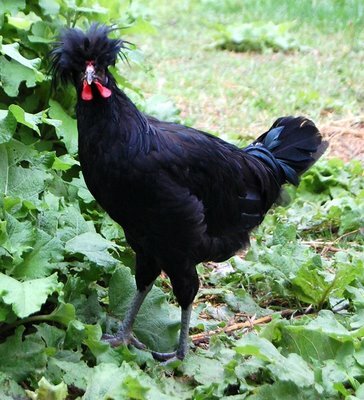 Crevecoeurs have red V comb that looks like horns on the rooster. 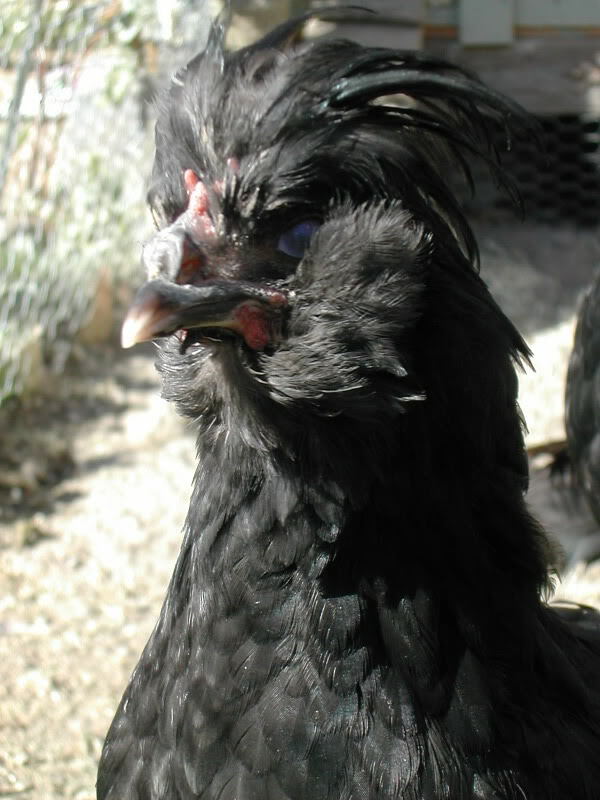 The hen conceals her smaller V comb with her crest. Both rooster and hen have small red wattles and earlobes. Their black beak with shades of horn color at the tip produces a stately but somewhat menacing appearance. Crevecoeurs support themselves on gun blue legs not favored in American meat markets but suitably matched to their striking plumage. In many ways the Crevecoeur resembles the Houdan breed except they have four toes in contrast to the five toed Houdan. the morning hours always helps as the days get shorter. Run your Crevecoeurs on wood shavings to protect their show plumage from dust and damage. Move the run occasionally to prevent the build up of parasites in the soil. The breed originated in Normandy, France. The name means “broken heart” after the town by a similar name. Most Crevecoeur historians classify them as France’s oldest and most foundational breed originating in the 17th century. Feed-efficient breeds have replaced the Crevecoeur as a meat fowl and have relegated it primarily to the exhibition hall. In the late 1800’s Crevecoeur owners crossed Crevecoeur with the Dorking breed to produce a larger Crevecoeur. Today’s Crevecoeur has considerable size over the Crevecoeurs of the last century. Their leg color, slower maturation rate, and susceptibility to colds has precluded them from major meat production. 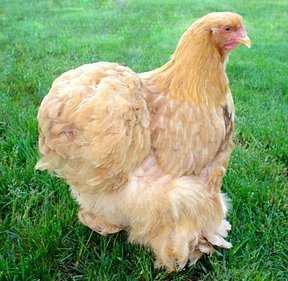 The American Poultry Association accepted them as a breed in 1874.